A hearty, easy to prepare entrée. Slice the peppers lengthwise and remove the stem, seeds and membrane. In a microwave safe container, blanche the peppers by placing each half of pepper cut side up in a single layer on the bottom of the container. Add 1/8 cup of water to bottom of container and microwave on high for 3-4 minutes, covered. Brown the ground beef with onions and garlic until beef is thoroughly cooked. Drain off any excess drippings from the meat. Add corn and continue cooking for 3 minutes. Remove from heat. In a large mixing bowl, combine the meat mixture, rice, cilantro, spices and salsa; blend thoroughly. 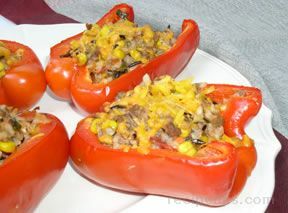 Fill each pepper half with the mixture and top with shredded cheese. Bake at 350º degrees for 25 minutes. Just before serving, add extra salsa on top of the cheese if desired.